This dish is the discovery of the year and we owe it to Vicky from tasteFull. As a busy mom, I have decided that some dishes will simply never make it to our dinner table for the insane effort they require to get there. 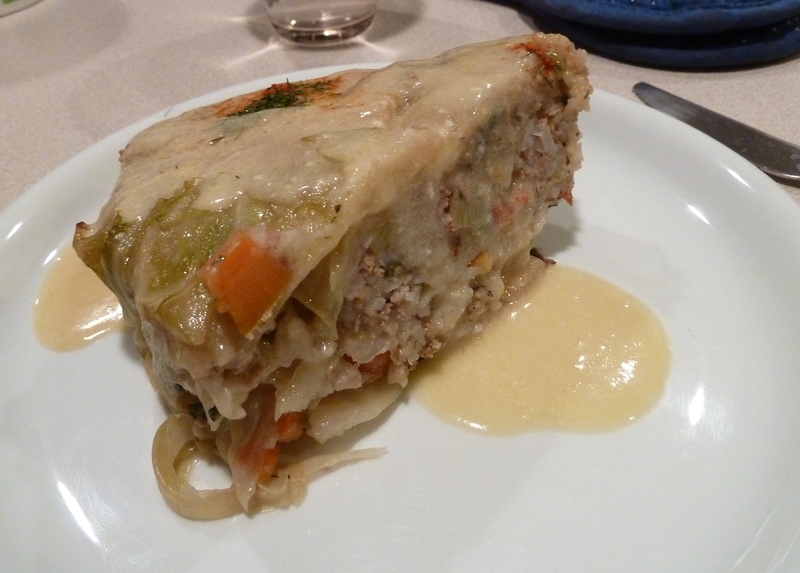 Stuffed vine leaves (dolmadakia) and stuffed cabbage leaves (lachanodolmades) are two good examples because they require folding stuffing in vine leaves of cabbage leaves one by one. This recipe changes the story, at least for cabbage leaves. The taste is divine, the presentation spectacular, and the effort cut by half. How to make: Remove the hard part from the bottom of the cabbage. Put the whole cabbage in a big pot with the hard part at the bottom. Fill the pot with water enough to cover the cabbage half way. Cover the pot with the lid and boil the cabbage for 15 minutes. In a big skillet, put some water and add the onions and the leek. Boil until the water evaporates. Then add some olive oil as well as the carrots, celery, red pepper, green onions, orange skin cubes, salt, pepper, and lemon juice. Saute the veggies for a few minutes. Add the rice, parsley, and dill and turn off the heat. Combine with the minced meat. Spread 4-5 tablespoons olive oil at the bottom of a 28cm pan. 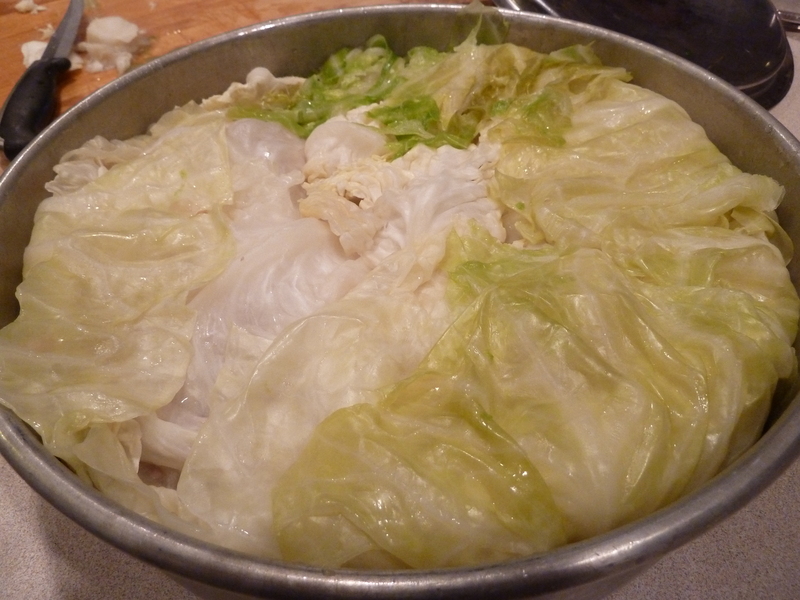 Take the boiled cabbage out of the pot and cover the pot with the leaves, starting with the outer leaves first. These are big and cover the pan nicely. Be sure to spread them such that the leaves are folding over the top of the pan generously. You will fold those in at the end. If this part is not clear check the photos that Vicky posted on tasteFull. 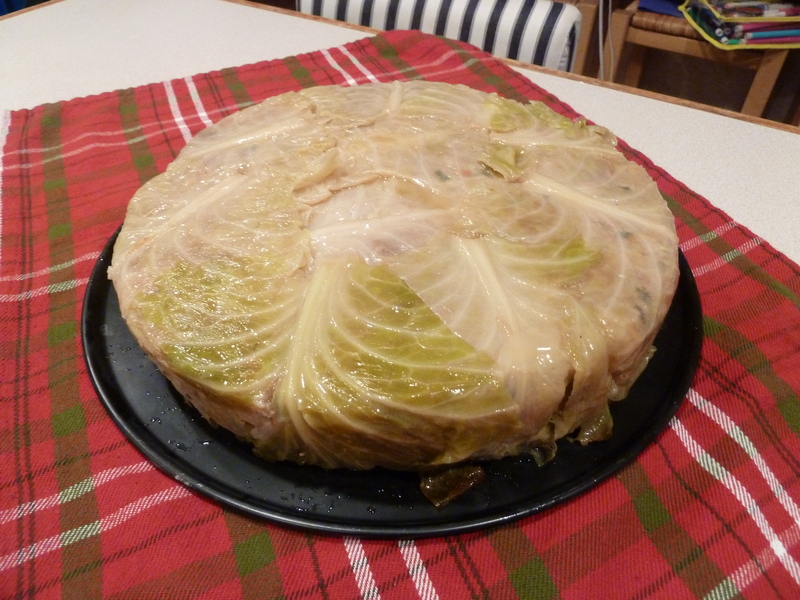 Vicky was able to add the minced meat and then spread another layer of cabbage. The cabbages we get in the US are smaller and enough for only one layer but that was OK. So, if you have a small cabbage like mine, after you have covered the bottom and sides of the pan, add the minced meat mix and press it tight. 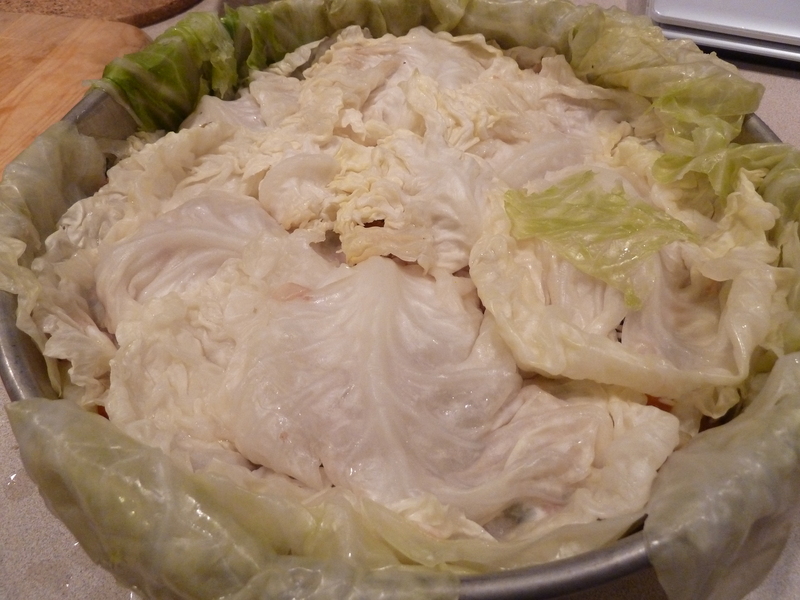 Cover the top with couple more cabbage leaves and ‘seal’ the top by folding in the top parts of the first leaves you had placed at the bottom. Press it down with your hands, spread some olive oil at the top, and fill up the pan with water all the way up. Cover the pan with aluminum foil and place it on a flat sheet (to catch any liquids that may overflow during cooking). Cook in a pre-heated 360F/180C oven for 3 hours. Yes, 3 hours. You will need to add about 3 cups of water during cooking. Flavor the water with salt and freshly ground pepper for extra taste. To make the egg sauce, bring a liter of chicken broth to boil. In a bowl, beat an egg and add the lemon juice, flour, and yogurt. Combine all the ingredients until smooth. Then sieve the mix and add it to the boiling broth. Keep stirring until it thickens. 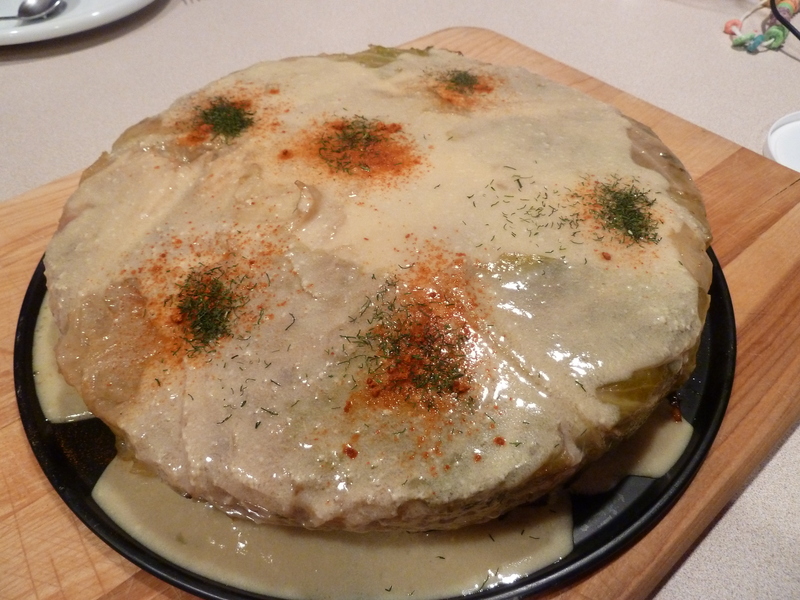 To serve, turn the cabbage pie upside down on a serving dish. Pour the egg sauce on top and decorate with paprika or cayenne and dried dill. Notes and tips: To reheat the pie, cover it with aluminum foil and put in a 250F/100C over for 30-45 minutes. The egg sauce can also be reheated in a pot.